Chocolate and coffee are always popular, so why not combine them into chocolate coffee cookies? 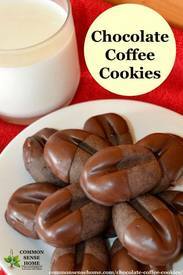 These coffee flavored cookies include cocoa in the dough, combined with semi sweet or dark chocolate coating. You can use chips, chunks or a broken up chocolate bar – your choice. You can use instant coffee, but if you want your cookies to be a little more high octane, you can use espresso powder. For more “coffee” and less “chocolate”, stick to one tablespoon cocoa. Two tablespoons of dark cocoa powder gives the cookies a deeper color, closer to a real coffee bean.